The authorities of Yinchuan, capital of the Ningxia Hui autonomous region in northwest China, "throw open their arms" to welcome investment, said Deputy Mayor Li Weidong. Thanks to a development drive by the central government, investment incentives have tilted toward western regions, offering Yinchuan enormous opportunities, Li said. Benefited from the drive, the city has enjoyed double-digit growth in gross domestic product (GDP) in the past five consecutive years. 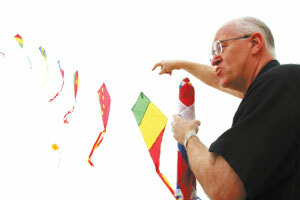 International kite flying competition hosted by Yinchuan. Its GDP rose to 39.3 billion yuan in 2007, contributing more than 40 percent of Ningxia's total. With plentiful energy reserves and an advanced transportation network, rich-resource Yinchuan is beckoning investors from home and abroad, Li said. The city is reaching out to attract further investment in its primary industries - chemicals, biomedicine, electro-mechanics, new materials and Muslim products. "We will pay more attention to extending industrial chains, encouraging companies to increase efforts in technological innovation and help them build up nationwide brands," Li said. With an ambition to be the most suitable city for living and starting businesses in northwestern China, the Yinchuan government has increased environmental efforts and streamlined administrative procedures, the mayor said. After environmental improvements, Yinchuan has hosted a national fishing competition and an annual international auto and motorcycle festival. Ningxia is home to largest population of Muslim Hui people in China. In its capital Yinchuan with a strong Muslim architectural style and atmosphere, Hui ethnic group comprises more than a quarter of the city's total population. Industries producing Muslim goods, including food and daily items, have emerged as a dynamic sector of local economy, Mayor Li said. In 2007 the sector generated 2.98 billion yuan in revenues, an increase of 28.9 percent over the previous year. Global demand for halal food prepared in accordance with Muslim beliefs will provide even greater prospects in the future, the mayor said. 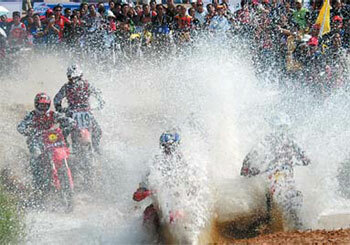 International cross-country motorcycle race in Yinchuan. Li said her government has allocated an annual fund of 5 million yuan to help conserve Hui culture and aid development of Muslim-oriented industries. Muslim industrial parks are listed among key projects by the city government. Local authorities have also established wide trade relations with Islamic countries and regions. During last year's China Ningxia International Muslim Food and Daily Items Festival held in Yinchuan, an annual trade event that began in 2006, governmental delegations and businesspeople from more than 40 countries in the Middle East and other regions participated. As Ningxia is a key production center of high-quality cashmere and Chinese wolfberries - a red raisin-like fruit used in traditional Chinese medicine - the regional commercial and transportation hub of Yinchuan is seen as an ideal distribution center. The city's cashmere industry has made substantial progress upgrading its processing capacity to range from raw materials to finished products, Li said. "We throw open our arms to welcome investors from home and abroad to Yinchuan and tap into business opportunities here," she said.